The Miami Marlins pitcher, who died at age 24, brought unique talent and a spirit of enthusiasm to the game that was on vivid display in this year's MLB All-Star Game when he faced Red Sox star David Ortiz. The wickedness of his breaking ball was exceeded only by the wattage of his smile. His personality, not just his arm, made Jose Fernandez of the Miami Marlins one of baseball’s brightest stars in ascension. At 24, Fernandez not only played baseball well, but he also did so with élan. He mowed down hitters with a combination of molten ferocity and boyish joy. No pitcher in the game owned a more brilliant future than Fernandez. He was on track to be a free agent after the 2018 season, he had the perfect wide-set pitcher’s build that Tom Seaver had, and earlier this year he reached 500 career strikeouts faster than all but two pitchers in history, Dwight Gooden and Yu Darvish. Last week he announced his pride at being an expectant father for the first time, sharing a picture on Instagram of his pregnant girlfriend with the hashtag #familyfirst. And then, in a dark instant, the future was gone. A 32-foot boat, a rocky jetty in the waters off Miami Beach, the darkness of 3:30 a.m. Sunday and what authorities termed a “severe impact” of the boat upon the rocks ended his life and all that promise. Two friends perished with him. As of Monday night, toxicology reports were pending, as was a determination as to who was driving the boat, owned by Fernandez, when it crashed. Fernandez died in the same waters that had once called to him in his dreams. As a boy, he and his mother, Maritza, had tried three times to escape Cuba for America by boat—at least once he came close enough to see the lights of Miami—and three times he failed to evade Coast Guard patrols that sent him back. Once he wound up in a Cuban jail for several months. In 2008 Fernandez tried again, sailing south, toward Mexico. At one point a fellow voyager fell into the water. Fernandez dived in to help and only upon reaching the woman learned that it was his mom. They successfully reached North America, then crossed into the U.S. through Texas, eventually settling in the Tampa area with his stepfather, Ramon Jimenez. A first-round draft pick of the Marlins in 2011, Fernandez was an instant success. He won the 2013 National League Rookie of the Year award after going 12–6 with a 2.19 ERA, the second-best mark in the league. He blew out his elbow in 2014 and had Tommy John surgery, but Fernandez made it back in 14 months without any diminution of his stuff. In fact, his rate of strikeouts per nine innings actually improved after the surgery, from 10.3 to a staggering 12.1. Fernandez averaged over 95 mph with his fastball, but his curveball is the pitch that astonished even the most grizzled baseball hands. At its hardest, at 89 mph, it morphed into a slider with the sweeping action of a fighter jet. The ball would start at the hip of a righthanded batter and dive to the lefthanded batter’s box. Batters hit just .138 off Fernandez’s curve, which will be remembered with the curveballs of Sandy Koufax, Bert Blyleven, Kerry Wood and Clayton Kershaw as the most vexing parabolas any pitcher ever traced in the air with a baseball. Fernandez last pitched on Sept. 20. He beat the first-place Nationals 1–0 at Marlins Park with eight shutout innings, allowing three hits and striking out 12. Of all the marriages between a pitcher and a place, none fit better than the one between Fernandez and Miami, the city of possibilities across the water from his birthplace. The win improved his career record in Marlins Park to 29–2, the all-time best mark by any pitcher in any ballpark (with a minimum of 40 starts). His home ERA of 1.49 is the best but for one other man in one other place: Koufax in Dodger Stadium (1.37). Fernandez was scheduled to pitch Sunday, but Miami manager Don Mattingly pushed his start to Monday to accommodate a start by Adam Conley, who was coming off the disabled list, and to give Fernandez more recovery time from his longest outing of the season. Few pitchers ever worked with more zest than Fernandez. His enthusiasm could chafe opponents, especially during the many games in which he dominated them. Fernandez was the embodiment of life—life on his pitches, life on his face and life in his body language—and so shall he remain in death, only now as a shocking reminder of life’s ephemerality. A deadly boating accident in the darkness recalled the deaths of Indians pitchers Tim Crews, 31, and Steve Olin, 27, on Little Lake Nellie in Central Florida in 1993. The last All-Star to die while an active player was Cardinals pitcher Darryl Kile, who passed away from a heart defect during the 2002 season at age 33. Over the past decade baseball was stunned by the deaths of Yankees pitcher Cory Lidle, 34, in a 2006 plane crash, and Angels pitcher Nick Adenhart and Cardinals outfielder Oscar Taveras in car accidents in 2009 and 2014, respectively. Adenhart and Taveras were just 22 and only starting promising major league careers. But the death of a player this young and this accomplished is nearly unprecedented. Chicago Cubs second baseman Ken Hubbs, the 1962 NL Rookie of the Year, died before the 1964 season in a plane crash at age 22. Hubbs was a .247 hitter with 14 career home runs who had not yet made an All-Star team. Jose Fernandez in action against the New York Mets during a game at Citi Field on Aug. 29, 2016. Jose Fernandez, center, celebrates with teammates after Marlins right fielder Giancarlo Stanton hit a game-winning walk off grand slam against the Seattle Mariners in April 2014. Jose Fernandez signs autographs before a 2013 game against the Nationals in Washington, DC. Jose Fernandez with his mom and grandmother in Times Square. Jose Fernandez has some fun with the Philly Phanatic before a 2014 game in Philadelphia. Jose Fernandez walks off the field during the seventh inning of a 2014 game against the Los Angeles Dodgers. Jose Fernandez at bat during a 2016 game against the Cincinnati Reds. Pinch hitter Jose Fernandez reacts after hitting a two-run, go-ahead, game-winning double in the 12th inning on July 1, 2016 in Atlanta. Jose Fernandez kisses his grandmother Olga after a 2-0 win against the Cincinnati Reds in 2015. Jose Fernandez reacts as he pitches in the first inning against the Kansas City Royals in August 2016. Jose Fernandez sits in the dugout during a 2014 game against the Los Angeles Dodgers. Jose Fernandez celebrates in the dugout with hitting coach Barry Bonds during a Sept. 20, 2016, game against the Washington Nationals. Jose Fernandez warms up during Gatorade All-Star Workout Day for the 87th Annual MLB All-Star game at PETCO Park on July 11, 2016 in San Diego. Jose Fernandez looks on during a 20134 game against the Philadelphia Phillies. Jose Fernandez during a 2014 workout as part of a Sports Illustrated photo shoot. Jose Fernandez drops the ceremonial puck to Jussi Jokinen of the Florida Panthers and Sidney Crosby of the Pittsburgh Penguins prior to the start of a February 2016 game in Sunrise, Fla.
Jose Fernandez poses with one of the Marlins' sea creatures at the team's Winter Warm-Up on Feb. 15, 2014, at Marlins Park in Miami. Jose Fernandez and second baseman Dee Gordon celebrate after they scored on a two-run RBI single by left fielder Christian Yelich against the Kansas City Royals on Aug. 24, 2016. Jose Fernandez before a 2013 game against the Tampa Bay Rays. Jose Fernandez is out after missing a bunt with two strikes during a May 9, 2016, game against the Milwaukee Brewers. Miami Marlins manager Don Mattingly and Jose Fernandez celebrate a 4-3 victory against the Arizona Diamondbacks on May 4, 2016. Jose Fernandez jokes with teammates prior to his team playing the Philadelphia Phillies in September 2013. Jeff Mathis talks with Jose Fernandez during a 2015 game against the Cincinnati Reds. Jose Fernandez laughs during a 2015 game against the New York Mets. Jose Fernandez looks on during an April 2016 game against the Washington Nationals. Jose Fernandez with a couple of big catches. Jose Fernandez on a fishing trip. Jose Fernandez during a 2014 Sports Illustrated photo shoot. Jose Fernandez in a quiet moment. The second All-Star appearance for Fernandez, just two months ago in San Diego, showcased his boyish exuberance. Before the game he joked that he might just groove a pitch to David Ortiz, the Red Sox designated hitter who would be playing in his final All-Star Game. 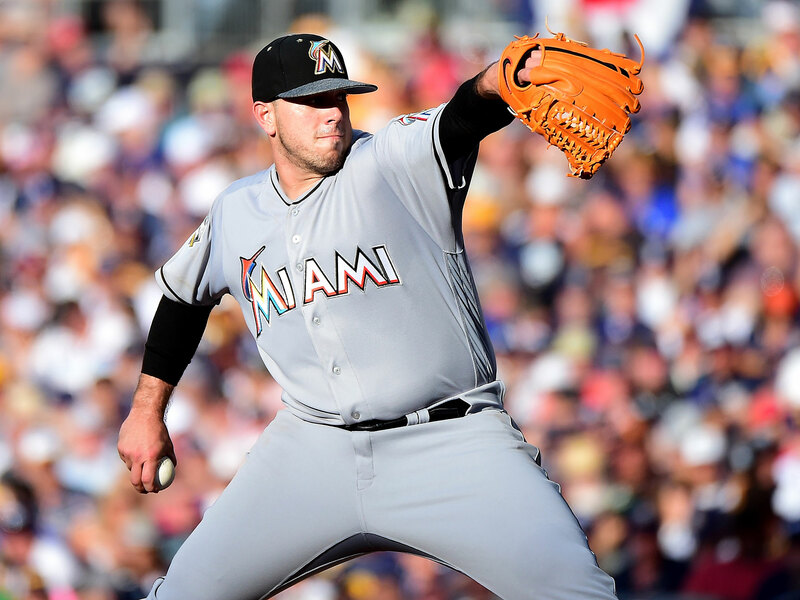 It wasn’t until Fernandez was in seventh grade that he was even able to watch major league players on television in his hometown of Santa Clara, Cuba. He was permitted to watch then only because the Cuban team was playing in the World Baseball Classic against the team from the Dominican Republic. Fernandez saw Ortiz hit a home run and was enthralled by the big man’s strength and style. Later, when Fernandez made it to America, the first baseball jersey he purchased was Ortiz’s number 34. They met for the first time last year. In San Diego in July, Fernandez found himself facing Ortiz with the bases empty and one out in the third inning. It would be the last All-Star appearance of Ortiz’s career. With his first pitch Fernandez floated the cookie he -promised—a -batting-practice fastball. Ortiz took it for a ball. Fernandez’s competitiveness then kicked in. He battled Ortiz to a full count. On the seventh pitch of the at bat, Fernandez threw a slider. It missed for ball four. Ortiz chuckled at the idea that Fernandez would not challenge him with a fastball, and Fernandez laughed himself and lightheartedly blamed catcher Buster Posey for calling the pitch.